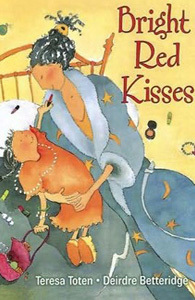 Teresa Toten is as colourful as the lipstick that stars in her picture book, Bright Red Kisses. Sitting in my living room in Toronto, she electrifies the space with her full-body gestures. And she recalls that as a teenager, she felt no connection with the “beige” people in the Canadian fiction she read, that the characters – “muted, reserved” – were nothing like the operatic people who made up her Croatian-Canadian community. As an adult, she realised that other children also have trouble relating to unemotional WASP characters, and so she set out to create stories that would reflect other experiences. 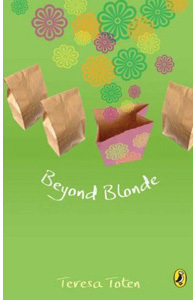 Over the past decade or so, the 50-year old Toten has published two young-adult novels with Red Deer Press – The Onlyhouse and the Governor General’s Award nominee The Game – and last year her first picture book, Bright Red Kisses (illustrated by Deirdre Betteridge), appeared with Annick Press. 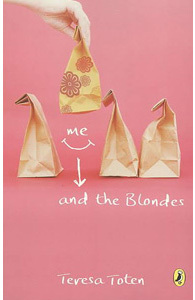 Now she’s about to unleash a third novel: Penguin Canada will release Me and the Blondes in April (see review, p. 73). 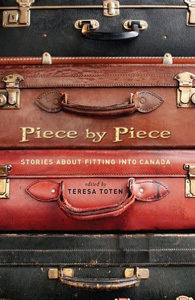 Toten’s is a small but strong body of work, full of mothers and daughters and the struggles of first-generation Canadians. Toten’s family left the Croatian capital of Zagreb for the tobacco town of Delhi, Ontario, when she was less than two weeks old, but it was the 17 further moves throughout her childhood that had the greater effect on her writing. Growing up, she says, she felt like “an inveterate outsider. I was hyper-alert to picking up cues in conversation – part of my survival instincts.” Her father died when she was a baby, and her mother worked two jobs to make ends meet, often moving in an effort to better their situation, Or fleeing irate landlords. 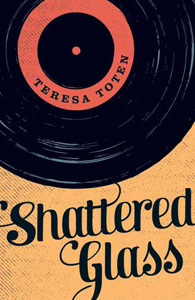 An adventurous latchkey kid, Toten was always burning food and breaking fixtures; once she swung from one medicine cabinet to another, bringing them crashing down. 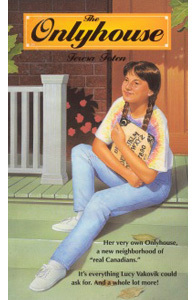 After moving back to Toronto, Toten enrolled in Peter Carver’s writing class at George Brown College and embarked on a picture book called The Onlyhouse, in which a young girl humorously reflects un her move from Toronto’s Kensington Market to a more upscale neighbourhood. 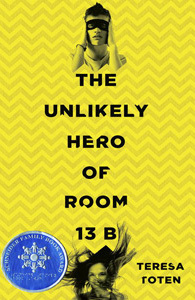 Carver and her fellow classmates ultimately convinced her that the book would work better as a novel, and author Tim Wynne-Jones edited the book for Red Deer Press, which released it in 1995. 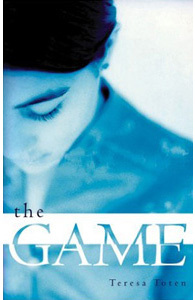 Toten’s next book, The Game (about an upper-crust American girl in a mental institution), followed six years later. Themes are the first step in Toten’s writing process; she starts each novel with a meaty question to keep herself engaged. 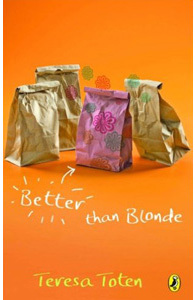 Me and the Blondes emerged from the poser “Are all secrets bad?” The novel also explores many of the same themes as her other works, centering on the heroine’s experience as a first-generation Canadian. Plucky Sophia Kandinsky has an absent, incarcerated father and a hardworking mother for whom English is a challenge. Sophia feels tenderness toward her mother, Magda, even as she’s embarrassed by her, while Magda is fiercely protective, loving, and exacting. The novel opens with the move, to a more patrician location and school, where Sophia must prove herself. 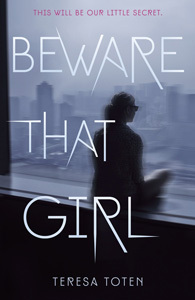 She begins the story as an outsider, but by its conclusion, she’s been woven into a tight-knit circle of friends. Toten’s books revolve around charismatic females, but she is adamant that boys respond to her work, too, even to Bright Red Kisses. Her experiences at schools across North America have led her to consider boys much more observant of girls than they are typically given credit for. “It probably comes from years of tracking their mothers,” Toten theorizes.